The Interview generated roughly $15 million in online sales and rentals during its first four days of availability, Sony Pictures said on Sunday. Sony did not say how much of that total represented $6 digital rentals versus $15 sales. The studio said there were about two million transactions over all. Probably they took advice from this guy. Maybe an opening question to this problem would be:. Do you think Sony had more rentals or more sales? This could lead to some interesting discussions before actually solving the problem. Here is the talk I gave at CMC-North last weekend: Video Games & Making Math More Like Things Students Like. Students generally prefer video games to our math classes and I wanted to know why. So I played a lot of video games and read a bit about video games and drew some conclusions. I also asked my in-laws to play two video games in front of a camera so we could watch their learning process and draw comparisons to our students. Video games get to the point. The real world is overrated. Video games have an open middle. The middle grows more challenging and more interesting at the same time. Instruction is visual, embedded in practice, and only as needed. Video games lower the cost of failure. As one of those weird AP Lit and AP Calc teachers – and a gamer – I think “story” is key in video gaming. Psychologists (like Willingham) and sociologists talk about the “story bias” of the brain. Nearly all long video games have a heavy story element. You are a character embedded in a story, be it open-ended or scripted. So often when I’m frustrated with bad game design I’ll push through because I’m committed to the story. So often when I finish the “missions” I give up on the well-designed “side-quests” because the story has rushed out of the game and it’s just a task-garden again. Not sure how you get rich story into math. How to become characters whose adventures we become invested in, not the scripted Jane who is trying to maximize the area of his pasture or the open-ended John who is trying to find a good way to estimate the number of people in a photo. Anyway – the first lesson I learn from video games is: humans will spend hours on a good yarn. My Panama Canal metaphor was just a joke from the onset so I had to admire Joshua Greene’s continued debunking. What Students Do (And Don’t Do) In Khan Academy, Ctd. My analysis of Khan Academy’s eighth-grade curriculum was viewed ~20,000 times over the last ten days. Several math practice web sites have asked me to perform a similar analysis on their own products. All of this gives me hope that my doctoral work may be interesting to people outside my small crowd at Stanford. One. Several Khan Academy employees have commented on the analysis, both here and at Hacker News. One contributor to the prevalence of numerical and multiple choice responses on KA is that those were the tools readily available to us when we began writing content. Our set of tools continues to grow, but it takes time for our relatively small content team to rewrite item sets to utilize those new tools. Ask questions that computers don’t grade. A computer graded my responses to every single question in eighth grade. That means I was never asked, “Why?” or “How do you know?” Those are seriously important questions but computers can’t grade them and Khan Academy didn’t ask them. 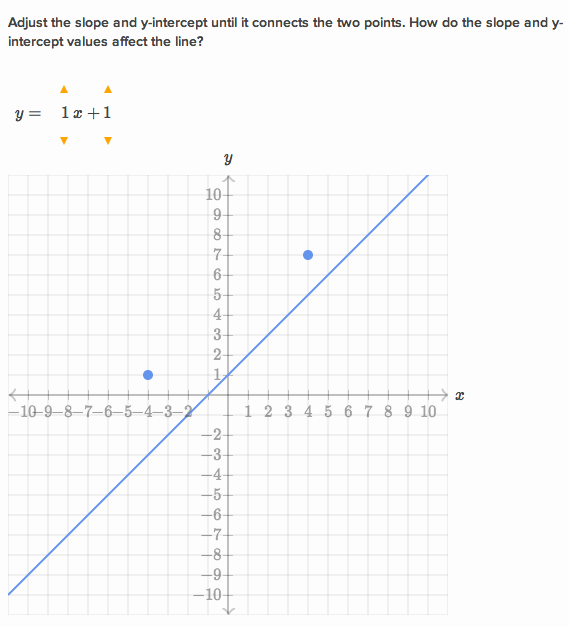 At one point, I was even asked how m and b (of y = mx + b fame) affected the slope and y-intercept of a graph. It’s a fine question, but there was no place for an answer because how would the computer know if I was right? So if a Khan Academy student is linked to a coach, make a space for an answer. Send the student’s answer to the coach. Let the coach grade or ignore it. Don’t try to do any fancy natural language processing. Just send the response along. Let the human offer feedback where computers can’t. In fact, allow all the proficiency ratings to be overridden by human coaches. Khan Academy does loads of A/B testing right? So A/B test this. See if teachers appreciate the clearer picture of what their students know or if they prefer the easier computerized assessment. I can see it going either way, though my own preference is clear. This was supposed to be a brief preamble to a post about what I learned at a recent conference, but it ballooned into this long, glowing mash note to the conference itself. You should find some way to attend next year. California Math Council’s conference in Monterey, CA, last weekend was the best conference PD I’ve ever experienced. Your mileage may have varied depending on your session choices (or whether you were even there) but every. single. element. fell into line for me. Great evening keynote with Tony DeRose of Pixar. (Shorter version here.) I love keynotes that are just outside, but not too far outside our discipline. An excellent pick of four sessions on Saturday. There were at least three great picks in every block. Painful choices. I went out for a few names I knew would be fun (Lasek, Fenton, Stadel). But I also ventured out for a name I didn’t recognize (Barlow) and learned an enormous amount about math teaching as well as about how to talk with math teachers about math teaching. I’ll share some details in a later post, which was supposed to be this post until I got all breathless about the conference itself. The Ignite sessions on Saturday evening were best-in-class. They were all entertaining and interesting, which is unusual enough, but three of them drew standing ovations. Five minute talks. Standing ovations. A standing ovation off of five minutes. Don’t worry. I’ll make sure you see them later. The community. I get such a charge off the crowd that assembles on the Monterey Coast annually. I walked around Point Lobos with mentors, broke bread with peers, and met lots of new teachers from local programs. One of the keynote presenters and I both gave talks we had already given elsewhere and we both noted how charged up the crowds were, how great the vibe was, relative to those other venues. No idea why, but I’ll take it. So great job, California Math Council. Everybody else: be sure to sign up to present and attend next year. What Would You Do With A $1,000 Classroom Grant? I’d install whiteboards on every vertical surface in the room. I’d make sure I had a good document camera. And I’d probably purchase video capture equipment, a hard drive, and a microphone so I could record my lessons. That’ll probably get you close to $1,000. @ddmeyer Whiteboard paint and huge supply of markers. @ddmeyer white boarded room + layered & movable whiteboards on top. markers. money for laminating std quotes & other student work in colour. @ddmeyer Big whiteboards around the room and a ton of markers, a doc cam, chart paper and markers. @ddmeyer whiteboard markers! Maybe some extra 2×3' whiteboards. Or use it to start a student run business with profits for the classroom. @ddmeyer I would cover as much wall space with whiteboards as I could. Crazy, right? What would you buy? $1,000 isn’t nothing, but there are lots of organizations giving away that sum and more to teachers. I have it on some authority that The Mathematics Education Trust has trouble some years giving away their (fairly substantial) grants. “Not enough qualified applicants,” I was told. So get out there. Get some cash. Get those high-tech whiteboards. BTW. I think we can trace some of this recent popularity of whiteboarding to Peter Liljedahl, an associate professor at Simon Fraser University. Liljedahl gave a presentation at the Canadian Mathematics Education Forum on whiteboards, which he called “Vertical Non-Permanent Surfaces,” which is why I’m looking forward to finishing graduate school.